WanderMan: Are You Getting The Best Gas Mileage You Can? - How To Find Out! Are You Getting The Best Gas Mileage You Can? - How To Find Out! 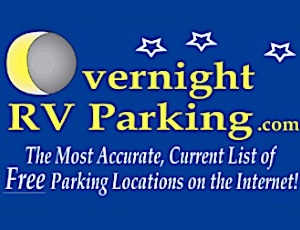 I admit it, I am obsessed with getting the best mileage I can on my RV trips. With fuel prices going up (again!) this season, I want to eke out as much as I can from each and every gallon. Now that's not to say I'll be traveling in the slow lane at 50 MPH on the highway...I'm not THAT guy! But I will be dialing it back to an efficient cruise speed. When I first purchased my RV, 3 hours North of San Fransisco, and drove it back to New York heavily loaded, I averaged 14.2 miles per gallon over the entire trip. On shorter trips, especially in hilly terrain, I average between 10.5 and 12.5 MPG. I was pretty sure it could do better. The question was, "why wasn't I?" 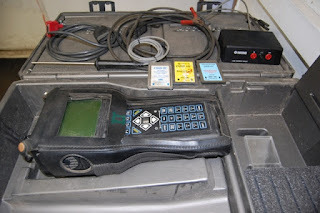 The answer was to gather more information about how my RV's engine is performing in real time. Here's how I did it...you can too! First off, my RV is an older model. It was built in 1991, so predates most of the OBD2 electronic engine management computing power that anything past 1996 would likely have. If you are lucky enough to have an regular OBD2 connector under your dash, figuring out what's going on under the hood will be MUCH simpler! There are any number of diagnostic tools that plug right in. In my case, it wasn't. While I do have a single board engine computer, it's rudimentary at best. I have a Chrysler V8 with Throttle Body Fuel injection (TBI) that's not so efficient and is sluggish to respond to changes ordered by the computer. That just means, when it calls for more (or less) fuel, it take a bit of time to happen. So there is a good chance I am running too rich at any given moment. That just means I am using up more fuel than I need to get down the road. How do I prove that and perhaps make it better? 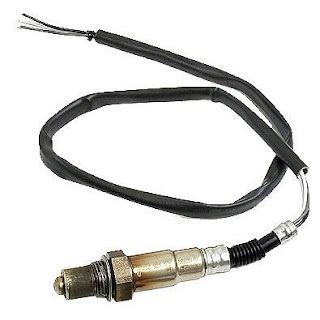 Anyone who has a late model automobile these days has heard the dreaded words, your O2 sensor(s) need to be replaced. That usually means a few hundred dollars out of the travel budget. 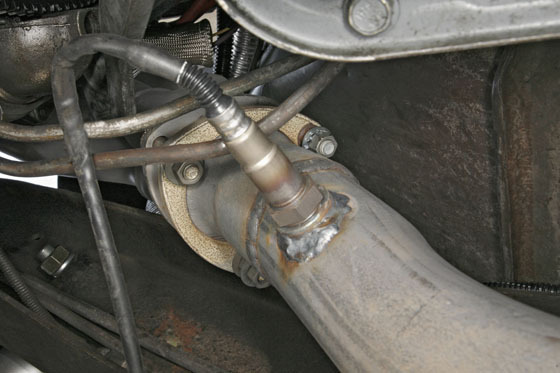 What the heck is an O2 sensor anyway? In the simplest system it just reads the amount of Oxygen left in the exhaust stream. You know, the stuff coming out of the tailpipe. If there is extra Oxygen then the combustion process wasn't complete. The goal is to put in just enough fuel for the amount of oxygen and have no oxygen or unburnt fuel left. There's a fancy scientific word for this, "stoichiometric." In modern cars, the computers vary the ratios of fuel and air to get as close as possible to perfect, therefore getting you the best gas mileage you can have. Sometimes O2 sensors go bad and the computer has no idea what the right mixture is, so defaults to a very rich condition, lest your engine go very lean, overheat and burn up things inside. Very expensive things. So, all this explanation just to get to what I did to monitor my Air/Fuel ratio. In post-1996 vehicles, you can buy a plug-in dash display that will read out all sorts of information (in real time) about your engine performance and all the numbers from all the sensors it's looking at. That is way cool. My system is too simple (and old) for that. While I do have a diagnostic port, it's pre-OBD1 (not 2...but 1) that reads rudimentary data and figures out what to do based on hard coded data. Not the best, but better than a old school carburetor. 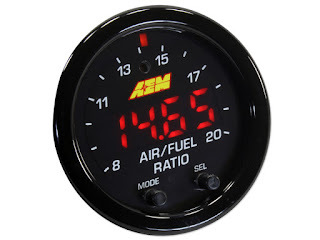 Since I wanted to monitor the Air/Fuel mixture in real time, I purchased a Wideband Digital/Analog display gauge with an included Bosch O2 Sensor. It was around $157.00 shipped. It was a kit with all the wiring harnesses and sensor included. I had to drill a hole in my exhaust and install a "bung" which is a weird term for a collar with threads inside so you can screw in the sensor. You could also use a clamp-on version, but I worried about exhaust leaks. Once done, I ran the wiring up front, zip tied it away from hot areas and spinning mechanical bits and connected the gauge. It was pretty easy. Only two wires to connect, 12 Volt power and Ground at the gauge. A snap to do under the dash. The sensor has a built in pre-heater that gets it ready to read your exhaust gases and it takes about 10 seconds to warm up. I started up the engine, let everything warm up and began watching the gauge. It will read from about 6.0 to 22.0 AFR (Air Fuel Ratio) you'll see different numbers at different engine loads. Lower numbers mean MORE Fuel and Higher numbers mean LESS Fuel. The goal is to stay as close to 14.6 which is complete combustion. This will likely never happen since performance will vary the amount of fuel all the time. Colored Lights Around The Edge Too! At idle, I was seeing 13.7 which is a bit rich, but about right for an idling engine with no load. A bit lower would be better, perhaps 13.5. Once in gear and moving forward slowly, I saw around 14.5, which is pretty close to perfect. Though there is some room for improvement. Once running at around 60 MPH, on a flat surface at top gear overdrive, I saw 14.8. That's OK, but we could lean it out a but, using less fuel and tune it to about 15.1 (just a little less fuel) to get better MPG. Depending upon your engine, it's cooling system and normal efficiency you may be able to go even leaner for best economy cruising, but I would get an exhaust gas temperature gauge and sensor to make sure I wasn't going too lean and burning a piston up. You would be sacrificing instant performance, but we're not drag racing! When I am cruising steadily and gently press the accelerator, you can see the effect of more fuel introduced into the engine as the gauge will drop to 12-12.5 as the onboard computer senses the need for more fuel (or your carburetor simply adds it). Releasing the throttle back to steady cruise should get it back to where you were before. Wide open throttle, something I don't usually do, will run extremely rich, around 11.5 for best torque. Great for hills, not so great for mileage! Gathering data to be able to modify the mixture for your terrain and driving style would be invaluable. Bear in mind, it's not always possible to change the value in your computer or adjust your fuel system at all. Proper maintenance goes a long way towards efficient running. So, now that we have all this information, what can we do with it? The simplest use is to modify your right foot behavior to keep the AFR at the most economical number you can. In my case, I started looking for issues with my fuel system and found a bunch of small air/vacuum leaks that were confusing my computer into thinking I was leaner than I actually was. It was dumping more fuel in to compensate and that wasn't doing my mileage any favors. Easily fixed. 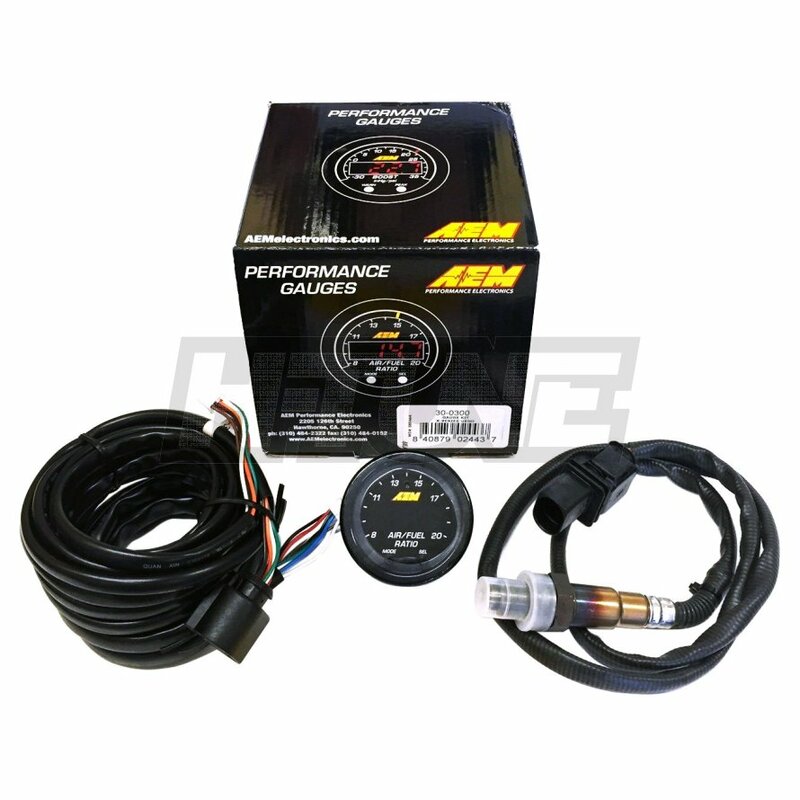 There are many fuel injection systems that can be modified. Some by simply adjusting some screws (potentiometers or physical) and some you will need to purchase or program a chip to modify how the computer thinks. That's a completely different story! So, how did I do? On the surface, it appears that I have made my engine a bit more efficient. I'll have to wait until my next longer trip to see if that's true. 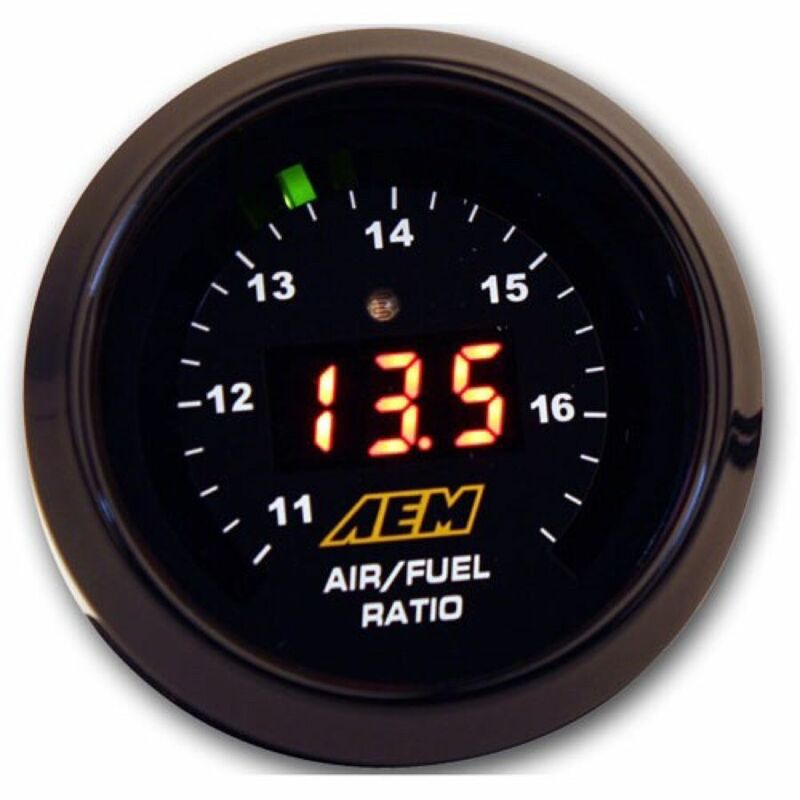 It didn't take too long to add the AFR gauge and sensor and it will give you more information to work with. If it gets my mileage up..it's worth it! Good job Rich,enjoyed your article,good research,my Ford V-10 Triton is not bad,like you driving condtions seem biggest factor,eg.stop and start traffic,big hills,strong winds.etc. Maybe i just have a heavy right foot :) I like the Triton, lots of modifications in the aftermarket available to increase efficiency. I'm a meter-junkie, so I use a "ScanGauge-E" which is very informative for vehicles that can use OBD2, since it gives you a rolling graphical mileage for you to "chase the meatball"... It also shows a few dozen other engine parameters, of course. With instant MPG feedback, some odd shifting and MDS behavior have been revealed, leading to non-intuitive throttle usage ("tap, release, resume"-ing the throttle keeps my engine in astonishingly high MPG mode without losing speed, but it falls out again after a bit, so TRR again...). With a little right foot training to stay ultra-efficient, I've actually gotten my 20,000 pound combo rig up to 15 or 16 on average for thousands of miles... the 2500HD truck deadheading can average just over 20! Pump confirms it's not a computer error - ~~30gallons 87octane drags my 35' T-trailer 450 highway miles safely. I keep talking to the dealer about why the engine/transmission program doesn't already run this well since it CAN. In a word, "wow!" That's some amazing hypermiling. I wish i could use the scangauge, bit my OBD1 (DRM3) isn't supported. I did build an MPGUINO and will likely get that installed sometime this year. it uses the pulses from my Gear Vendors Over/Underive unit. Will give me full trip computer functionality...likely a bog help. Well, that and a vacuum/MP gauge anyways! Why Is Paint Matching On RVs So Difficult!?! Security For Your RV - Is It Really Needed? ?